I saw a mammal that looked like a large squirrel. I haven't seen anything quite like it. Can you help me identify it? 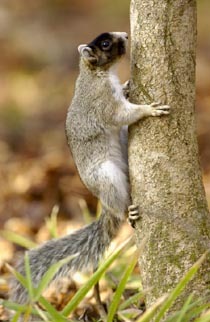 It was too large to be an eastern squirrel—approximately 2.5 feet, from nose to tail. It had a fluffy tail like an eastern squirrel, not short and rat-like like a ferret. Black face with white nose, body was chestnut-brown. I saw this on the ground, not in a tree. I saw it in a pine forest in east-central Alabama. At one point, it sat up on its hind legs. Taken from here, this website also contains some additional information. Not the answer you're looking for? 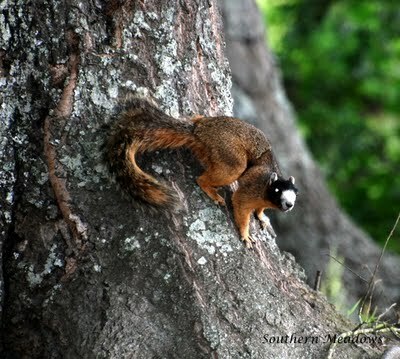 Browse other questions tagged species-identification mammals or ask your own question. What is this marmot-like animal (Tigray, Ethiopia)? What species is this worm? What species of fox is this?